This information on The Tour of the Bras d’Or Lake has just come to my desk from my very dear friend Jacque Cote, and so I am sharing it with all those who love to take part in the VELO events. They are always a great time for cyclists and the tour will cover such beautiful areas. Here is hoping that the weather stays fine for the tour and I will be out to take some pictures of the event when you are in my area. The Bras d'Or Lake is a large body of partially fresh/salt water in the centre of Cape Breton Island. It is a 100km x 50 km basin “basin ringed by indigo hills laced with marble. " - Silver Donald Cameron. This tour is aptly called “The Insider Tour” as the small group of 25-26 cyclists will be led to discover well kept secret destinations, ride a mostly unknown part of the Island, stop at great inns, enjoy great cuisine and good company. This is a fully supporter tour where everyone cycle the 360km flat to rolling terrain at their own pace and style. No pressure. VCB Members are invited to ride with the participants on any day of the tour. More info on the 360km fully-supported "pampered" tour. ITINERARY: Clockwise direction leaving Sydney Friday Aug. 16th to Monday Aug. 19th. Day 1: 87km to St. Peter's; Day 2: 78km to Arichat via Cape George, Dundee and Rocky Bay Isle Madame; Day 3: 114km to Iona via Marble Mtn. ; Day 4: 80km to Sydney. There will be optional side tour suggested to shorten or lengthen the day’s ride. DETAILS: We provide: 3 nights hotel/motel accommodation, luggage transportation, bike mechanic assistance, support vehicle at your service should you need a lift or other assistance, healthy meals Friday evening to Monday morning, snack food enroute. If you haven’t yet had the “VCB Touring Experience” there’s never been a better time to try it out. Riders of 16 to 18 years of age are welcome but must register with an adult. PREPARATION: Tour is on flat to rolling terrain. Lots of time to ride at your own pace and style. No pressure. Cycling on Cape Breton Island requires a moderate level of fitness. Bicycles must be in good working order. Final Update sent to all participants. In just a short week, our group of 28 touring cyclists will be underway on the 1st leg of the Tour du Lac Bras D'Or in 4 Days. An 85 kilometre jaunt that we will have an entire day to ride at our own pace. Day to Day in a nutshell. Day 1 - Days Inn, Sydney to Bras D'Or Lakes Inn, St. Peters, 85 km. Meet: Days Inn, 480 Kings Road, Sydney. This is Route 4 all the way. See map and profile here. Except for a couple of climbs, grade 4-5%, to nearly 100m about half way, there's nothing serious for all pumped up cyclists on Day 1. Paving is excellent up to km-60 approximately where we might see road construction for a 5km stretch then a fairly decent road to destination. End of Day 1 - Bras d'Or Lakes inn. Day 2 - St. Peter's to Auberge Acadienne, Arichat Isle Madame, 81km. or 68km optional short ride. After last evening copious dinner and today's yummy breakfast, the road around Cape George to Dundee at about the end of West Bay, will be a "piece of cake" to be delighted. Although the SAG Van will carry good sustaining food and refreshments, taking a lunch at the Dundee Resort won't be a bad idea as this is the only and real place to get something half decent on our route. Over the mountain on Black River Road, we will end up in Louisdale by the Lennox Passage. Maybe not the Bras D'Or Lakes but this part of Cape Breton Island is the most best kept secret of the Maritimes. The long route to Rocky Bay is recommended but the more direct route to Auberge Acadienne is optional. See Map. End of Day 2 - Acadienne Inn, Arichat. This is our longest ride of the tour on a route that usually benefits of good tail winds and super quiet roads. Back on the other side of the mountain we will ride by the inviting beaches of Dundee, through the quiet communities of West Bay and Marble Mountain, the "Fort MacMurray" of early 20th century, where the white marble quarried there was used to build mansions in Halifax and in the making of steel in Sydney. The Portage road will bring you on Washabuck Island and on to Iona, a quiet heaven centrally located in the Highland Heart of Cape Breton Island. See Map. End of Day 3 - Highlands Heights Inn. Hope yesterday's ride and last evening ceilidh helped you sleep like logs. This morning's healthy breakfast, a last embrace of the gorgeous scenery and we're off for the last leg to Sydney. The cherry on the cake is that challenging climb to the top of Barrachoix mountain and the sight of the finish line where we started four days earlier. See Map. A set of four detailed maps with a topo map background will be in your Ride Kit distributed on Friday morning before the start. SAG van will arrive at the Days Inn around 9:00 am to load your belongings. With a bit of planning, carpooling to the starting point can be arranged among the participants whose list and email is found below. The SAG (Support And Grub) Vehicle will also be the emergency vehicle. We will have basic bicycle tools and limited spares on board. There will be fruits, bars, cookies, water, juices on board. The van will stop at various locations indicated on the maps and at the "general meeting" the night before at dinner time. There is limited space in the SAG van for participants in case of mechanical or physical failure. The SAG van will manage to reach the day's destination at approximately the time the majority of riders will arrive.... not necessarily be there ahead of the fast riders. Each and everyone will be responsible to load and offload their belongings at destinations. Although the van is not to be used for personal transportation, special services, i.e. pick-up gift-souvenirs, purchases, etc. could be arranged at the driver's discretion on its way to day's destination. Any other use of the SAG van, i.e. to pick-up an item left behind, will be charged at 20¢ per kilometre. Since distances are small in general, there's the scenery, the visit, the social aspect and the "elevations" components to take into account. in the planning of your day. Everyone will be on their own so to speak... on their own to ride with whom they choose to, to stop everywhere they like to visit, shop, eat. This is your tour and we don't want to interfere with your interests nor decide what you should do or not do. 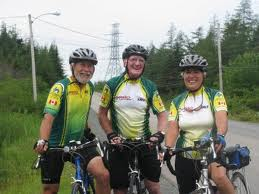 As organizers, our goal is to help you reach your objective of cycling and enjoying those four active holiday days around the Bras D'Or Lakes to the maximum. Upon arrival at day's destination, you might choose to bike around to the beach, have a swim, go to the wharf, to the shops or get your room keys, get a shower, lay down for a short rest, go for a walk, chat around with new found friends. Meal time will be arranged on consensus among the participants before the start of the day or at the "general meeting". Popular is 6:30pm for dinner and 7:30am for breakfast.We have arranged for healthy choices of main course food (meat, seafood, vegetable) at the three locations. If at all possible we will provide the kitchen chefs with an approximate number of each servings our group will need. Should you have allergies of special dietary needs (i.e. vegetarian, gluten free...), please let us know ASAP, so to inform the kitchens in due time. One so far has asked for gluten free meals, any more? St. Peter's, Arichat and Iona are very small and quiet communities located in natural unspoiled environments. Quite a contrast for those coming from busy, noisy and populated cities. We hope you will take the time to soak in these special rare environments. Access to breakfast usually is by 7:30am. which should give ample time to change, pack up, load the van, fill the bottle(s) on the bike and leave around 9 a.m. or so. Should you decide to leave earlier or later, it will be up to you but we would appreciate your stuff in the SAG Van no later than 9:00 a.m. Also, leaving early or later in the morning, the SAG van might not be yet at the rest stop or might have left when you'll arrive. Very hard to predict. However, being surrounded by rather cold water, there's rarely large swings of temperature during a 24-hr period. August is probably the time of the year that overall temperatures reach their maximums during the day and night.... and this is not very high... Temperatures around 25C is usually on the rather high side. You would not need long thighs however you might need a long sleeve jersey over the short sleeves to start in the morning, take off the LS at mid-day and putting it on by end of afternoon if you're still on the road if it's really on the cool side. Casual multi-purpose clothing is recommended for non-cycling time. Rain? It's been VERY VERY dry in Cape Breton lately. We just hope that the trend will continue; according to Environment Canada, it will. That's the good news. However, be prepared, just in case. Any questions, concerns, don't hesitate to get in touch with us.